For an emergency dial 911. If you need to speak with an Officer call the Police Radio Room at (215)343-0100. For further business, office hours are from 8:00am – 4:00pm Monday – Friday. Chief Friel is a twenty year employee of Warrington Township. In 1996 he began his employment with the Township, having served as Fire Inspector, Code Enforcement Officer, Deputy Fire Marshal, and Acting Fire Marshal before becoming a Township Police Officer in 2000. Chief Friel became a patrol supervisor (OIC) and Field Training Officer during his second year with the department. In 2007 he was promoted to the rank of Patrol Sergeant, and then became Sergeant of Detective’s in 2010, Lieutenant in 2013 and Deputy Chief in 2015. Throughout his career, Chief Friel received specialized training in leadership, command, supervision, field training, SWAT, counter terrorism, criminal investigations, and narcotics. He served 10 years as a tactical operator/team leader on the Bucks County South Central Emergency Response Team which is a regional SWAT team that covers Warrington Township. Chief Friel was also one of the organizers and original founding members of the Bucks County SWAT HAZMAT team that was formed in 2005. He traveled around the country with his team mates for extensive specialized training through Homeland Security in Weapons of Mass Destruction and Counter Terrorism as part of their assignment with this team. Chief Friel is a graduate of the Pennsylvania Chiefs of Police Command Institute (2008) and the Northwestern University School of Police Staff and Command (2010). In the spring of 2015, Chief Friel was selected to attend the prestigious FBI National Academy in Quantico Virginia which is a top level professional development course for US and International law enforcement leaders. He graduated from the 260th Session in June of 2015. Less than 1% of law enforcement officials ever get the opportunity to attend this academy. Chief Friel is only the 4th Chief of Police in Warrington Township history. Warrington Lions Donated $5,000 to the police department for personal protective equipment. 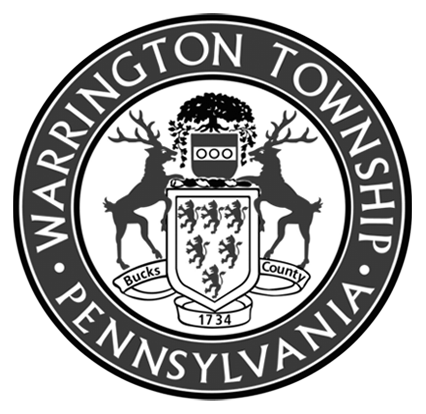 It has been brought to our attention that some homeowners let their dogs run at large in the neighborhoods of Warrington Township. We want to remind those of you who own dogs that our leash law requires owners to keep their animals leashed when not on their property. This is for the safety of our Township residents and also for your pets. Our “pooper scooper” law requires defecation to be picked up and sanitary removed from all Warrington Township property. Thank you for being responsible citizens and good to your neighbors. We encourage you to use “Mutt Mitts” that are located at each of our parks for your convenience. Failure to comply with result a fine up to a $1,000 for non-compliance.